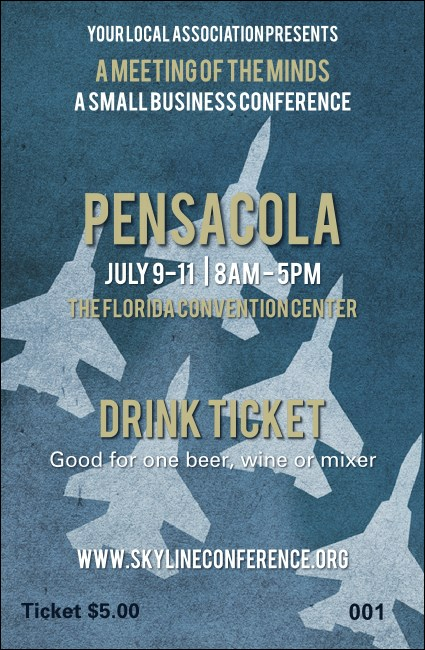 Aim for the best on the Emerald Coast with the Pensacola Drink Ticket. Featuring a patriotic scene well known in the Florida Panhandle, with the Blue Angels in formation over the deep blue sky. Need more promotional materials? Make it a match with a Pensacola Event Kit. Cheers to this classic design! Celebrate your at P-Cola event with the right design from TicketPrinting.com!